One time I told James that I wanted to make a giant color wheel, made entirely of photos of the colorful doors all over DC. He calmly replied that he can only muster the appropriate enthusiasm for so many of my ideas, and I needed to decide if that one was where I wanted to invest my capital. I’m still thinking it might be worth it, because I love color. As I walked around Paris this week, I found myself entranced afresh by this bright city of many colors. Yes, the average Parisian only wears the the trinity of black, grey, and beige, but the city itself — she puts on a show. …I can arrange them all in a giant color grid. Done. You’re welcome. I may have cried a little bit when I looked at the finished product. Because COLOR. And ORDER. And THAT TINY CAT WITH ITS HEAD OUT THE WINDOW. Anyways, all this to say that this city never ceases to amaze me. Looking forward to sharing it with my students when they roll in tomorrow morning! This entry was posted in Uncategorized and tagged beauty, color, France, iphone pics, Paris. Bookmark the permalink. 15 Responses to Paris by the colors. Oh, I totally get that. 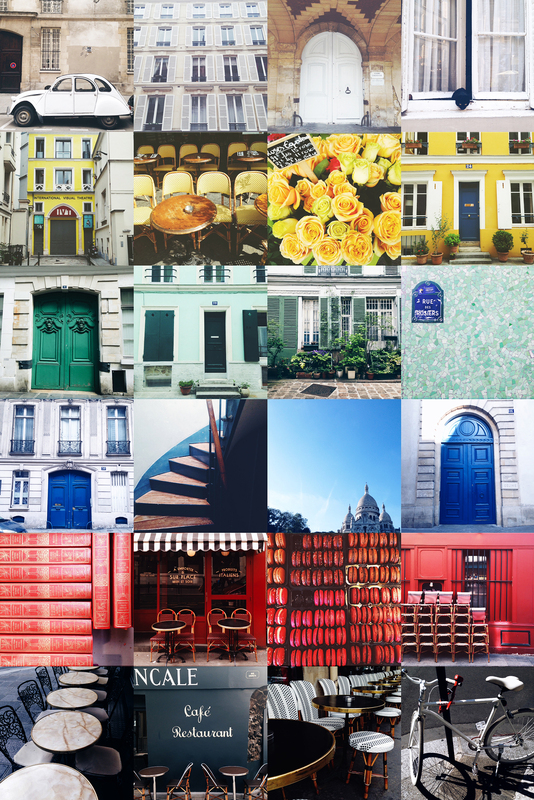 Nearly all the photocollages on my blog are arranged by color (e.g. a trip to Copenhagen: https://dietauschlade.wordpress.com/2013/10/23/danemark-9/). Je te souhaite encore un très bon séjour à Paris (et puis bien sur en Allemagne)! Merci!!! Je ne pense pas qu’on va passer par Berlin… mais je suis contente quand même de visiter la région de Munich! I completely teared up at that amazing collage. Because you’re so right about the color. And that little cat with its head out the window. Also, for what it’s worth, I would go to a museum to see a parisian door color wheel. You’re awesome! I wish I was one of your students 😊. I really enjoy your posts…. Keep em coming! LOVE THIS. I’ll be in Paris in June and would love any recommendations on non-touristy things to do (like what streets to wander down, etc). Honestly, the touristy things are all pretty awesome, though the touristy restaurants – not so much. If you search through Paris posts, I have a decent number of things that I recommend. I really enjoyed the trek to Rue Crémieux this time to see all the colorful houses, and I always love wandering Le Marais. Isn’t it totally adorable? Love me those little cars… even if I can’t really fit my tall self in them.